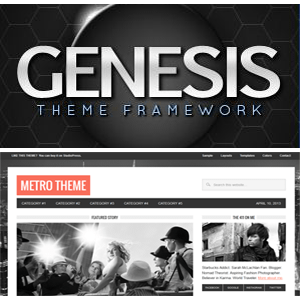 Visit StudioPressClick here to preview and browse the entire Genesis theme collection! Now that you have WordPress installed and working on your new website, it is time to get rid of that boring WordPress theme and style it with a professional theme from StudioPress. The reason I stand behind StudioPress is because it offers powerful features right out of the box that WordPress doesn’t include. These features include excellent search engine optimization, powerful theme design choices, impressive and comprehensive security testing on all themes, flexible site customization, and many of the themes are now mobile responsive. Mobile responsive? What’s that Scott? Well, this website is built from the Metro theme and responds to the width you have your browser set to. Click on the edge of your browser window and make your browser narrower or wider and see how this site reacts. If you have access to a tablet or smartphone, access WebHostingChoose from those smaller screens and see how this site auto-formats to fit the screen. This is powerful and a must-have because mobile devices are quickly becoming the most-used Internet devices. To top it all off, StudioPress’ billing is very impressive. They aren’t offering an annual “Developer Option” or varied limited-term pricing, instead, their prices are a one-time-fee that gives you access to unlimited support, unlimited updates, and unlimited website installations. In fact, if you choose to become a designer, you can setup your clients with Genesis, your purchased child theme(s), and you are still within the license agreement! This is why I highly recommend purchasing the Pro Plus Package from StudioPress. With that one $349.95 purchase, you will have access to all current themes and future themes as well. This means, as the Genesis framework improves, you’ll have access to their latest themes that take advantage of their newest features. Also, you can borrow features from other themes and incorporate them into your current design. 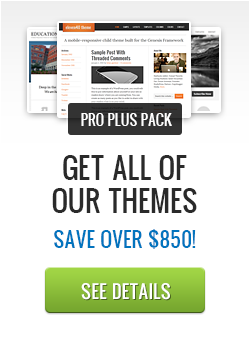 Quick note: It is important to understand that the Pro Plus package does not include themes designed by the community. If there are themes that you love from the Community Themes page on the StudioPress website, please understand that you will have to purchase those themes separately. Discover and preview Genesis child themes at StudioPress. Purchase the Pro Plus Package. Access the downloads area of StudioPress after you’ve made a purchase. Download the Metro child theme. Access the WordPress dashboard from your newly installed WordPress installation. Install the Metro child theme. Activate the Metro child theme. Delete (clean up) the default WordPress themes that were automatically installed. As a reminder, I have the WordPress video training series available if needed. The video also shows you how your website will look after installing the Metro child theme. As you can see, the theme does not look like the demo that is provided by StudioPress and needs a lot of configuration to get it to look the same. In the next video of the series, I will walk you through the steps to get this theme looking exactly like the demo. I consider this final step a medium/advanced stage of the setup process. If you have a theme you love but need assistance getting it setup exactly like the demo, I’d be glad to help you. Please subscribe to the Lifetime Access plan on the signup page or provide proof that you’ve signed up through InMotion Hosting through this website, which is lesson 02 of this training series, and I’ll help you get your theme configured like the StudioPress demo. Have a question? Leave your questions, comments, or suggestions in the comment box below and I’ll answer as quickly as possible. If you do not want your comment to be public, just add a memo in the comment that you wish for your comment to remain private and I’ll respect your wishes. If marked private, I will respond via email, so make sure the email address you provide is valid. Thank you! I’m always glad to help. > where to find it? Dear Scott, Thanks for the videos, these are a godsend. Thanks a lot for Awesome Videos,Need more posts like this Dear Scott Buehler. Greg, in most cases, absolutely, but if you are working with the Genesis framework and your child theme messes up, it will revert to the default Genesis theme that is displayed if you do not install a child theme. That’s why I delete everything except Genesis in my videos. Hope this helps!